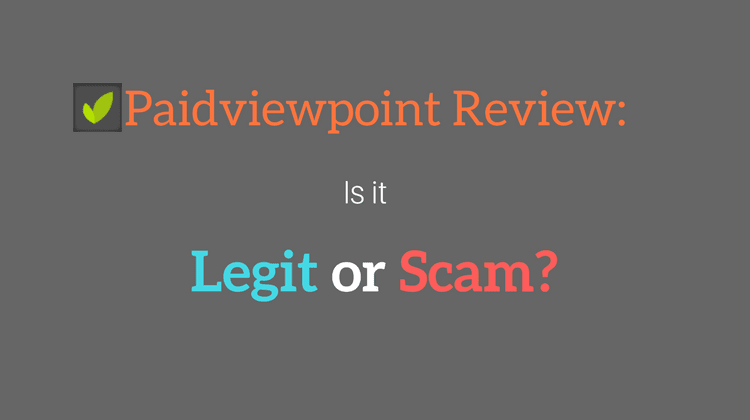 Paidviewpoint Review: is it Legit or Scam? Paidiewpoint is a market research survey company which is owned by Umongous and operated by AYTM (Ask your target market). AYTM is an online market research solution that helps brands and agencies gain insights. Paidviewpoint has a simple design. While I was reviewing Paidviewpoint, I didn’t face any difficulty understanding the navigation buttons. You won’t face any problem while finding what you need. The site is not cluttered with menu options. You rarely see such simplicity. Is Paidviewpoint Legit or scam? Before writing a review, I carefully research about the site (so that you don’t have to do it). And don’t write a review for it until I am sure that it is legit or scam. So when I say that a site is legit you know, it’s true. The same I did with Paidviewpoint and found (not surprisingly) it to be a legit and paying survey site. I did not found any complaint saying that Paidviewpoint is not paying or being a scam. Which was surprising, I mean how often you see a survey company without a scam complaint. The only complaint against Paidviewpoint was that the surveys are not high paying. It is true, but they don’t pay attention that they are also very short. On top of that, once you start a survey, you are never disqualified. You will start off slow, but as your Trait Score (we’ll talk about trait score later) rises you will receive the most surveys per month and earn more for each survey. As I said in the beginning of this review, Paidviewpoint is a survey company, not a GPT (Get Paid To) site. So the only ways to earn money from Paidviewpoint are Surveys and Referral program. Another good thing about Paidviewpoint is; it doesn’t have a point system. You don’t have to worry about the value of a point. You will earn cash not points. In the beginning, you will only get trait surveys. "So, what are trait surveys?" Trait surveys are vital for your success at Paidviewpoint because it is through these surveys that Paidviewpoint gets to know you. And when it knows you well it can provide you relevant surveys. You are already familiar with survey sites; they have disqualified you more than you can count. You are disqualified in the middle of surveys because they don’t know you. But since Paidviewpoint knows you well, you will only get those surveys for which you are pre-qualified. This means you will never see this message ….” Sorry, you did not qualify for this survey” at Paidviewpoint. Each Trait survey pays $0.3-$0.10. I know it’s a small amount, but these are short, containing 10 questions, and generally, take 1-2 minutes to complete. So, it’s not taking much of your time. For each Trait Survey ou complete your ‘Trait score’ will increase. Well, Trait score measures one simple thing: how well Paidviewpoint knows you. You should give attention to it because, the higher Trait score you have the higher paying survey you get. In other words, as your Trait score goes up your earnings increases. You will regularly get 1-2 Trait surveys. So your Trait score will increase slowly, but as your Trait score goes up you will begin to get the Biz Surveys. Biz surveys are the usual surveys that you see on other survey sites. But at Paidviewpoint, they don’t start by asking qualification questions. Paidviewpoint has sent you that survey, because you are qualified for it. This is the best thing about Paidviewpoint. We all know how annoying it is to spend 10 minutes on a survey just to get disqualified. At Paidviewpoint that is no longer a problem. These surveys take 2-5 minutes to complete and pay from $0.10 to $2. Biz surveys are short like Trait surveys, but you may get some long surveys. Which is good because long surveys pay more. On top of that you don’t have to worry about being kicked out. So, if you see a survey that takes 20 minutes to complete, just take the opportunity and get your bucks. Longer the survey the higher it pays. Other than Trait and Biz Surveys you can also earn by referring your friends. You can earn up to $25 per friend. You will earn 20% of what your referral makes through Biz surveys (not trait surveys). You need to refer at least 100 users to become a VIP member. When you become a VIP you earn 20% of your referrals earning every time they complete a survey not just when they cash out. Note: You won’t take anything from your referrals. You get a bonus 20% for referring them. They will earn what they deserve. You can get your unique referral link by going to refer a friend tab. You can also change your link. when you change your link previous link will not work. Is there an app for Paidviewpoint? Currently, there is no Paidviewpoint app. But it’s fine, you can still take surveys on your Smartphone. Paidviewpoint works great on mobile browsers like chrome, Firefox and Yandex. So, even though Paidviewpoint app is not available you can complete surveys and earn on the go. How to get more Surveys on Paidviewpoint? Completing more Trait surveys. Yes, this is the only way you can get more survey invites. There is no Paidviewpoint hack or cheat. If you find any website claiming to have one, don’t believe it. They don’t have any hack or trick. What they are doing is trying to hack your computer not Paidviewpoint. So beware. And don’t try VPN or Proxy, this will get your account banned. Trait surveys increase your Trait score. And higher Trait score means more surveys. Reach the Trait score of 9000 to get the maximum number of surveys per month and earn per answer. You can redeem your earnings as soon as you have $15 in your account. But it takes time to accumulate depending on your demographics. You can redeem your cash through PayPal. Paidviewpoint promises to deliver your payment within 72 hours. Before cashing out you will need to confirm your Mobile number. Paidviewpoint needs to confirm your number to be sure that you are the one cashing out and there is one account per person. First and the most obvious rule is one account per person. I’m sure you already know this because every rewards site has this restriction. The same rule applies to your mobile number. When you change your number your balance will be zeroed. You will start off slow, but as you complete more Trait surveys, your trait score will go up and higher Trait score will help you get more surveys and your earnings will increase. The surveys offered by Paidviewpoint are generally short and take 2-5 minutes to complete and pay between $0.10 and $2. And don’t forget, you can also earn up to $25 per friend you refer. Best thing about Paidviewpoint is that you will never get this annoying message:”sorry, you did not qualify for this survey”. And that’s a big plus. This is the reason why Paidviewpoint is the only survey site that I highly recommend. Besides this, Paidviewpoint works smoothly on mobile too. What do think of my Paidviewpoint Review? Do you know any other survey sites similar to Paidviewpoint?